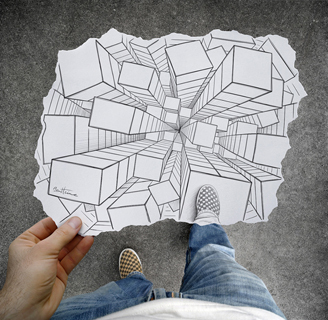 Ben Heine Art 1 is a part of his series "Pencil Vs Camera" in which Ben Heine creates 3D drawings that bring the surreal into the real world through photography. 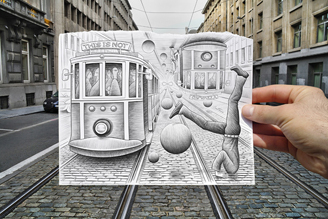 Heine uses acutely detailed graphite drawings to bring his imagination into the real world. In this piece, a self portrait, Heine sits across from a drawing of himself, actively creating the sketch that is about to take a close up photo of his face. This mostly monochrome image is brightened up with splashes of red detail.